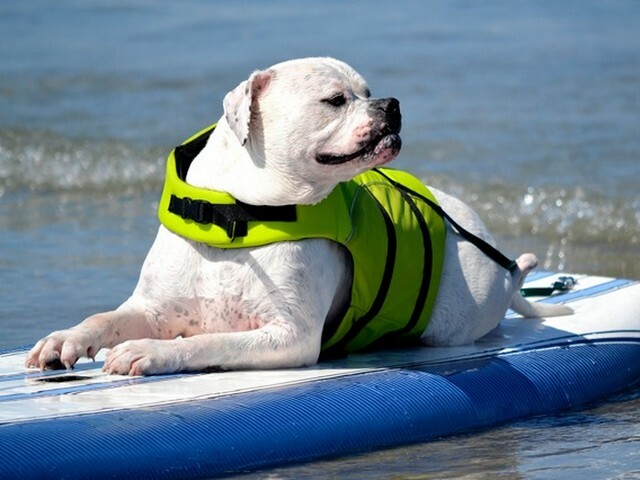 Humphrey, this adorable American Bulldog, who was rescued as a 1 1/2 year old stray from an Los Angeles shelter, minutes before to be euthanized in 2008, became a strong, well mannered and social dog, which incredibly loves the water. Not so graceful on the land, but was a king of the pool, where he started to swim as a therapy for his hips. After he learned to stay on the surf board in the 'SURF DOGS' school (also known as SurFURS) in Southern California, USA, he really enjoys the surfing and unwillingly leaves the beach.